This weekend I have been working like mad to make some tea cups for a swap I joined in the Facebook Group called “Life’s a Quilt” This swap is a remembrance quilt of the group founder Rhoda Forbes that unfortunately passed a way this winter. 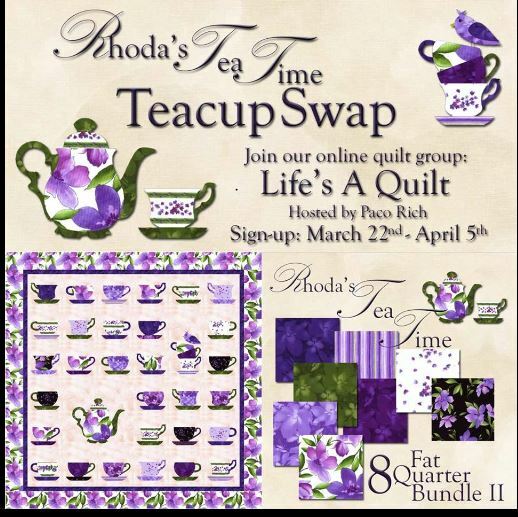 Any one is able to join this group there is a lot of fun with swaps, free sew alongs, free mystery quilts, ect. I have decided that I was going to make a wall hanging instead of the quilt. I am using all small printed flowers for my tea cups. Since I have tons leftover from the early 90″s. lol I’m still waiting on the teapot and stacked cups that will be released soon. In the mean time I played with my eq7 program to make a mock layout of what I want my wall hanging to look like. this is it: I did decide to swap cups with just a couple of people that I already knew and trusted. I’ve been burned in the past in swaps so am real leery. I’ll sent them 2 cups and they will send me 2. The great thing about this is we were able to give ideas of what we would like in our cups and then they showed me the fabrics for approval. I cant wait to see how this will turn out. These are the cups that I will be sending out: The Canadian one is a bonus to the host Paco Rich who lives in New Mexico. I did have to redo some since the size for the blocks is 6 1/2″ x 6 1/2″ and I had made 2 that were 6″ I will use these in my own project and scale down the rest so the are a consistent size. These are my mistake ups: The green one was the 1st one I did and was not happy with the stitching. Now I just have to wait for the pattern of the stacked cups, teapot and the blocks to get here from their makers destination. This is such a fun and easy project it has helped me work with the blanket stitch and perfect it by the time I got to the last cup. I sent a huge thank you to Paco Rich for hosting this…Here is her blog if you are interested: PJ’s Crafty Creations Check out her 3D hexagons tutorials she makes it look so easy. I will keep you posted when I have finished my “It’s Always Tea Time” wall hanging. Next Long arm or sit down?